When data reaches important thresholds for your business, data-driven alerts automatically send email notifications to key people users specify. 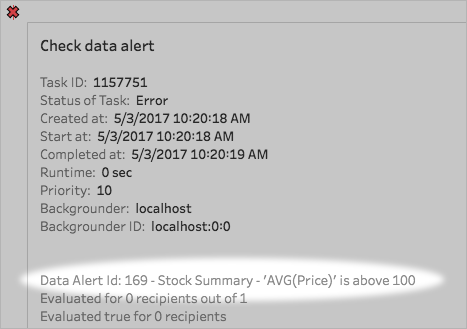 As a Tableau Server administrator, you set up data-driven alerts much like you do subscriptions. For information about how users create and manage these alerts, see Send Data-Driven Alerts in Tableau User Help. Note: To create and receive data-driven alerts, users need access to related databases and views. See this list of requirements for details. If alerts are enabled for a site, any user on that site can create them. Complete the steps in Configure SMTP Setup so the server can send email. While viewing a site, click Settings at the top of the browser window. Under Email Settings, enter a site-specific "From" address or message footer. A site's "From" address and message footer are also used in emails for subscriptions. At the top the browser window, click Tasks, and then click Alerts. Select any alerts you want to update. Add or remove yourself as a recipient. Edit alerts to change data thresholds, delivery schedules, and the full list of recipients. Change alert ownership to different users, or delete alerts. Data-driven alerts are supported for all sites by default, but administrators can disable them for specific ones. Under Data-Driven Alerts, uncheck Let users create alerts and receive alert emails. Tip: To entirely disable data-driven alerts at the server level, change the tsm configuration set option, features.AlertOnThresholdCondition, to false. By default, Tableau Server checks every 60 minutes to confirm whether data conditions for alerts are true. If you notice performance impacts, you can customize this time interval with the tsm configuration set option, dataAlerts.checkIntervalInMinutes. Regardless of the dataAlerts.checkIntervalInMinute setting, the server also checks alerts whenever extracts in the related workbook are refreshed. To check an alert more frequently than the setting specifies, change the extract-refresh schedule. The "Find" task limits "Check" tasks to alerts that can currently send related emails. For example, if a user has chosen an email frequency of "Daily at most", after the alert condition becomes true, the server waits 24 hours before checking the alert again. Each "Check" task uses one server backgrounder process, loading the related view to evaluate the alert condition. If all users see the same version of a view, it loads only once. But if users have applied filters to a view, or the data they see is limited by user-level security, the view loads once for each recipient. Note: Starting in Tableau Server 2018.3, alert owners will be automatically notified when an alert fails ten times. Administrators can customize when alert owners receive notifications. Administrators can configure Users will not be notified for alerts that failed prior to upgrading to Tableau Server 2018.1. A workbook, view, or data field is removed or renamed. A data source becomes inaccessible. Tip: To automatically get emailed when alerts fail, follow the steps in Collect Data with the Tableau Server Repository, and connect to the "background_jobs" table. From that table, create a custom view that includes the "Check If Data Alert Condition Is True" job name and its finish code. Then set up a data-driven alert to email you whenever a finish code equals 1 (failure).